Kevin T. van Bladel (Ph.D. 2004, Yale University), is Associate Professor of Near Eastern Languages and Cultures at The Ohio State University. He is the author of many studies on the classical Near East including The Arabic Hermes (Oxford 2009). This historical study argues that the Mandaean religion originated under Sasanid rule in the fifth century, not earlier as has been widely accepted. It analyzes primary sources in Syriac, Mandaic, and Arabic to clarify the early history of Mandaeism. This religion, along with several other, shorter-lived new faiths, such as Kentaeism, began in a period of state-sponsored persecution of Babylonian paganism. 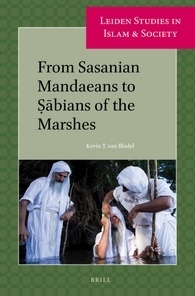 The Mandaeans would survive to become one of many groups known as Ṣābians by their Muslim neighbors. Rather than seeking to elucidate the history of Mandaeism in terms of other religions to which it can be related, this study approaches the religion through the history of its social contexts.